I’ve been working on this painting since January; I finished last Sunday. The pomegranate had shriveled to a third of its original size, and I had to buy a ball to use in place of the pomegranate to refine the shadows on it. I learned a lot while creating this painting: about how to paint folds in cloth so they looked like folds in cloth, how to see values, how to handle the paint. I have a much lighter touch using the brush now and I am a faster painter. And I enjoy the painting process much more than I used to. In the end it was meditative to work on this painting. I started this painting with the intention of glazing the pomegranate with red. 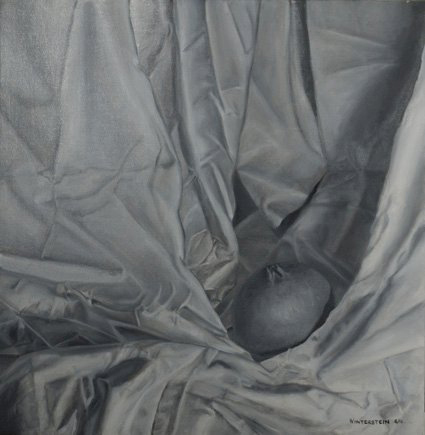 I have never glazed over a grissaille (a monochromatic underpainting) and had wanted to try it with this painting. However, I’ve decided to try glazing on a painting that I haven’t spent so much time on. It’s been a long haul and it was with some relief that I broke the setup down. However, I couldn’t start another painting because I was experiencing a letdown. My friend Tracie Thompson quipped that I was experiencing post partum depression. I am looking forward to starting the next painting today.